A controversial paper published two years ago that concluded there was no detectable slowdown in ocean warming over the previous 15 years - widely known as the "global warming hiatus" - has now been confirmed using independent data in research led by researchers from the University of California, Berkeley, and Berkeley Earth, a non-profit research institute focused on climate change. After correcting for this "cold bias," researchers with the National Oceanic and Atmospheric Administration concluded in the journal Science that the oceans have actually warmed 0.12 degrees Celsius (0.22 degrees Fahrenheit) per decade since 2000, nearly twice as fast as earlier estimates of 0.07 degrees Celsius per decade. This brought the rate of ocean temperature rise in line with estimates for the previous 30 years, between 1970 and 1999. Climate change skeptics attacked the NOAA researchers and a House of Representatives committee subpoenaed the scientists' emails. NOAA agreed to provide data and respond to any scientific questions but refused to comply with the subpoena, a decision supported by scientists who feared the "chilling effect" of political inquisitions. "Our results mean that essentially NOAA got it right, that they were not cooking the books," said lead author Zeke Hausfather, a graduate student in UC Berkeley's Energy and Resources Group. NOAA is one of three organizations that keep historical records of ocean temperatures - some going back to the 1850s - widely used by climate modelers. The agency's paper was an attempt to accurately combine the old ship measurements and the newer buoy data. "Only a small fraction of the ocean measurement data is being used by climate monitoring groups, and they are trying to smush together data from different instruments, which leads to a lot of judgment calls about how you weight one versus the other, and how you adjust for the transition from one to another," Hausfather said. "So we said, 'What if we create a temperature record just from the buoys, or just from the satellites, or just from the Argo floats, so there is no mixing and matching of instruments?'" In each case, using data from only one instrument type - either satellites, buoys or Argo floats - the results matched those of the NOAA group, supporting the case that the oceans warmed 0.12 degrees Celsius per decade over the past two decades, nearly twice the previous estimate. In other words, the upward trend seen in the last half of the 20th century continued through the first 15 years of the 21st: there was no hiatus. "In the grand scheme of things, the main implication of our study is on the hiatus, which many people have focused on, claiming that global warming has slowed greatly or even stopped," Hausfather said. "Based on our analysis, a good portion of that apparent slowdown in warming was due to biases in the ship records." In the same publication last year, NOAA scientists also accounted for changing shipping routes and measurement techniques. Their correction - giving greater weight to buoy measurements than to ship measurements in warming calculations - is also valid, Hausfather said, and a good way to correct for this second bias, short of throwing out the ship data altogether and relying only on buoys. 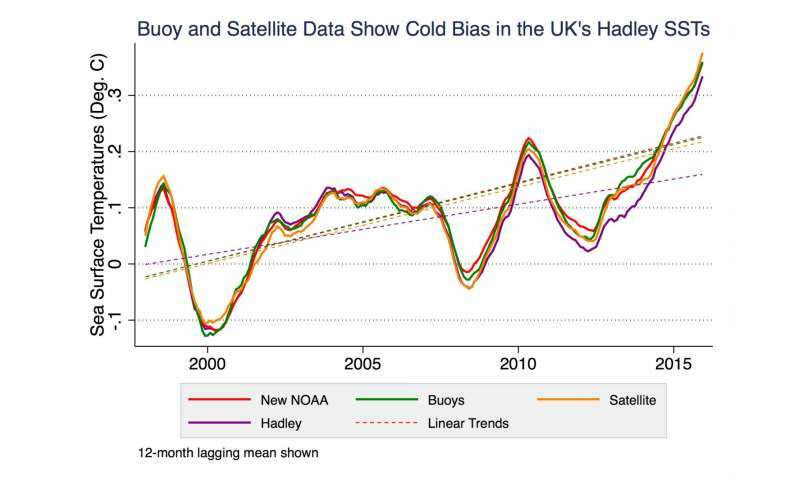 "In the last seven years or so, you have buoys warming faster than ships are, independently of the ship offset, which produces a significant cool bias in the Hadley record," Hausfather said. The new study, he said, argues that the Hadley center should introduce another correction to its data. "People don't get much credit for doing studies that replicate or independently validate other people's work. But, particularly when things become so political, we feel it is really important to show that, if you look at all these other records, it seems these researchers did a good job with their corrections," Hausfather said. Co-author Mark Richardson of NASA's Jet Propulsion Laboratory and the California Institute of Technology in Pasadena added, "Satellites and automated floats are completely independent witnesses of recent ocean warming, and their testimony matches the NOAA results. It looks like the NOAA researchers were right all along." These are just sea surface measurements, which doesn't show the whole picture. The real story is how much heat is trapped down below, or cold water for that matter. Where does all the cold water from the melting poles go? After correcting for this "cold bias,"
The cold Pathological lies of the AGW Cult and their Pathological "science". The ARGO buoys are the GOLD standard in SST measurements, yet they must be corrected..er..excuse me..cooked..to propagate the cult's desire for doom and gloom. The engines probably intake huge volumes of water. The outflow would be 10's of degrees warmer. The inlet would not warm up much at all until it reaches the heat exchangers. I'm calling BS on this one. Engine-room samples are artificially high compared to bucket-sourced samples... Buoy samples do not have this artificially inflated temperature so clearly the solution is to inflate buoy samples? If you're looking for fractional variances I can't imagine taking surface temperatures let alone utilizing data from samples tainted by the hull of a giant metal ship. The list of variables is already high enough without artificially introducing more. This seems like an effort to make bad data good by making the good data bad and is exactly the type of psuedo-science that has the average consumer questioning whether truth is the true motivation of what is passed as science these days. All the datasets, including the ship data, show that ocean temperatures are rising. The only difference is by how much, and they are close. All the datasets are nearly the same except for the ship dataset. This proves there is a bias in the ship dataset. Clearly the heat transfer from the hot engine room to the water in the metal intake tubes is a factor. I would guess that doing an experiment where the water temperature is measured along the path of the water flow (in front of the ship to the engine itself) would show a temperature gradient. Three independent data sources all show the same thing: no hiatus. The deniers, of course, attempt to obfuscate the results, as usual. The article is not all that well written, and enables obfuscation. Do better, phys.org. Or, the idiots could just read the paper. However, that would require that the aforementioned idiots actually understood science. Not going to happen. Ever. No wonder the Canadian Immigration website is getting hammered. I kind of doubt that that is due to Australians and New Zealanders! "Give me your tired, your poor, your huddled masses yearning to breathe free......and also send us your village idiots, and hard of thinking, and religious loonies,...Hell, we don't care, if you can't deal with the nutjobs, then we'll take them. Sh*t, we've just elected one!" Is that written somewhere? If not, it should be. Well it looks like the AGW deniers can eat more crow. It's looking more and more obvious that new and improved data shows the globe warming much faster that previously thought. Well now that we all agree AGW is happening, it's now a question of how to address the problem and workout the a solution. No wonder the North Pole is melting. Average global Ocean surface temps have increased 4C (7.2F) since 2000. I mean wow! In 16 years, we've done 4C damage to the oceans. If we don't figure out how to stop this thing, by 2200 oceans will BOIL! His mancrush, Al, just dropped a hot load and out he came with it, so no wonder he's boiling. @jonesdave, that's the nature of democracy. As Churchill famously said, it's the worst form of government other than those others that have been tried from time to time. What does democracy have to do with science or reality? Nothing. With reality? A great deal. It's the reality of what people want. With science? It's the way science works. If you've got the data you publish. Doesn't matter who you are, as long as you have the training and the data. Hold on to yer' conclusions. Of course the data will need to be checked for manipulation to achieve a desired result and checked against the best available climate history (I believe Oxygen 18 to 16 isotopic change is one method). Well then, what do you call it when 97% of an extremely tiny number of self-proclaimed "climate experts" who stand to personally benefit from a few trillion in grants vote that we're all gonna die unless we all give up our freedom and treasure to Marxist/totalitarian/socialist/statist politicians who will do anything whatsoever to consolidate their power over the ignorant masses? A corruptocracy, that's what. Why does every single proposed "solution" serve the Marxists in their goal of amassing power? Still coming off the last ice age. Time to worry is on the downslope. I think I would have to go with the buoy data as it is going to be a lot more accurate than any reading taken in a ships engineering spaces. I was a ships engineer (boiler technician in the US NAVY) and I'm absolutely sure of that one. If it's going up on the buoy readings, it's going up. It's that simple. I think they should have said 'warm bias' instead of 'cold bias' though as the temp readings would be higher almost as soon as the water enters the area inside the hull. You seem to not understand the relevant scientific facts about basic physics and the heat balance; most of the heat from any global warming would end up in the surface waters of the ocean and not much deeper down. So, yes, surface temperatures don't give the 'whole picture', but they show most of the picture and still can prove there is a general global warming trend. The global warming deniers had already a totally none credible position. Now their position is even less credible than it ever has been. If it's going up on the buoy readings, it's going up. The trick is that there wasn't and isn't a global coverage of the buoys; if it was going up in one place that doesn't necessarily mean it went up the same everywhere. That's why the researchers have to mash all the different sources of data together to get a global coverage of measuring points. Trouble is, all the different sources have different offsets and errors. Looking at just one of the sources at a time is biased and prone to error, exactly because none of them have global coverage, so in doing so you have to apply fudge factors to emphasize and de-emphasize the raw data. That in turn creates large uncertainties which are rarely mentioned when discussing the outcome. For example, if you have just one buoy in the middle of the pacific ocean, you have to make a pretty huge false generalization about the whole ocean based on just that one thermometer. That is the problem with old data from the 60's etc. I don't think you understand what this quote means. Read it again. You don't really understand how the grant system works, do you? Not one dollar of a grant goes to increased pay of a scientist. Not one. Scientist salaries are fixed (and abysmally low). A megawatt-size engine needs lots of cooling. About half the waste heat is lost through the cylinder walls and other friction losses which heat the engine itself. 2) The difference of the offset is very minute (0.1 degrees). Which is on the same order of magnitude as the warming per decade they're trying to measure, so it's a huge difference. Scientist salaries are fixed (and abysmally low). The money goes towards the institutions that hire the scientists. If you have something like a for-profit research institute or university, it makes sense for them to hire scientists who return the most money. Cooking of the data, confirms manmade Globull warming. antigore, please take your font off of "spraycan", and clean up your posts. Your petty and adolescent insults are more suited to Twitter. And are 166 and Eikka cheaters? Why do they expect everyone else to cheat? Perhaps they assume we are all alike. Come on, everyone understands hot substances rise, the understanding of physics for that is about a second grade level. It's all about the volume of cold/hot water and where it's located. Take ENSO for instance, it's 'blobs' of warm or cold water rising from the depths periodically. This happens all over the oceans, not just the pacific. The temperature everywhere in the oceans below a certain depth is about the same everywhere, about ~4C. There is some temperature changes below that level but it is only above that level that most of the temperature changes occur. If you don't believe me, just google it. 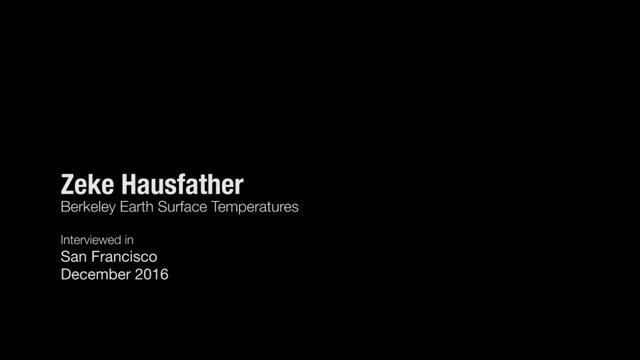 This is why surface temperature is more relevant than deep water temperature. The temperature everywhere in the oceans below a certain depth is about the same everywhere, about ~4C. I'll take your word for it. Do we know if/how that depth has changed over the years? The other concerning thing is the delta between the two levels. We see in the atmosphere the mid-latitude cell is essentially being snuffed out by the stronger polar and hadley cells, the same thing is likely happening in the oceans. A wavering jet stream is analogous to wavering ocean currents, but on a much larger and long term scale for the latter. Since meltwater is fresh, it doesn't go nearly as far down as you might think. It's not just about temperature, it's also about salt concentration. That's a good point barakn, another variable I excluded. I'm sure ocean salinity has an effect on currents as well. I don't know enough to say what that is, but it's irregular so obviously it will cause some change. Here's a good fact sheet about thermohaline circulation. Do we have the link for the Cooked water temps? I take it that you want the data in order to reproduce the work and prove your allegation that the data is "cooked"
Fig. 5. Time from 2000 to 2015 looks like cooling by 0.05? buoy temps? Fig. 6 is the same from 1998 to 2012. You do realise that you are looking at temperature differences between data sets and not actual changes in temperature don't you? Did you read any of paper or did you just look at the pretty pictures? So, you read the paper? Explain to us, the scientific reasoning for the cooling bias corrections? The question to you, is did you read the paper Mr. Anti-goracle? Obviously you did not troll, so explain your reasons for denial. Your an obvious denier, so what is your motive? Are you stupid? Did you not see the obvious hockey stick in your forest-trees graph? The hockey stick your friend Al-Gore showed so plainly in his movie "An Inconvenient Truth". The quality of many of the comments is, perhaps, a sign of the times. However, I suspect that the authors are so familiar with the art of metrology that they didn't feel it necessary to explain a few things in detail. Firstly, searching and correcting for sources of measurement bias is and has always been difficult and time-consuming. Secondly, designing measuring sets that will stay precise and accurate under those conditions is not easy; oddly for such a common measurement, temperature has always been a challenge. Finally, anyone who has tried it will be aware of the difficulty of estimating a representative temperature of a fluid. Try that on the air in your oven at home. Apart from the usual variables of radiative transfer (probably negligible here), and gradients due to convection, we would expect some irregular heating due to friction and turbulence when water is being pumped into a ship. The latter point at least should have been mentioned (perhaps I missed it). "I've been labeled a "Climate Denier" because I oppose the Science Deniers and their government/corporate puppet master propagandists. " No, you've been accurately described as a denier because you regurgitate denier talking points and jump gleefully into conspiracy theories in lieu of rational arguments.